THE FASHION IN SHROUDS – On style, history and the making of things. On style, history and the making of things. This was another surprise when we first saw the standard 8 films; some of it is in colour, and quite early, too. This is a pre-WWII sequence showing my great-grandparents and my grandmother at their summer house in Bredsand. They have lunch or dinner in the garden. My great-grandmother Gerda does gymnastics and smells the roses in beach pajamas, great-grandpa Einar or possibly his friend Henning sternly tells the dog Tollie to stay out of the flowerbed, and then the grown-ups go for a picnic by boat with another friend of Einar’s, IP, with wife and daughter. My grandmother is in her late teens and stays behind with a friend. I think my grandma is the girl in the yellow bathing suit playing badminton later on, but it’s hard to tell. There are a couple of boys playing with toy trains who may be my grandma’s cousins, a male friend of hers in a stunning bathing suit and a short end sequence featuring a tightrope walker. It’s summertime in Sundsvall in the late 1930’s. My great-grandmother wears two different beach pajamas in these films, one of them has a lot of screen time here, and by the late 1930’s she was in her mid-40’s. I always assumed that beach pajamas were worn by fashion-forward young women in the 1930’s, not middle-aged women in provincial Swedish towns, but clearly they were. Great-grandma was affluent and comes off as quite stylish in all of these films, but she is not that young here, and I really enjoy seeing that. Women were expected to dress their age to a much higher degree in those days than we are today, but clearly, there were options to retiring into conservative old lady styles – at least if you had the kind of money and leisure available to these people. The large, merrily patterned bathrobes also show up an awful lot in these films. Einar seems to have spent a lot of spare time around the summer house wearing a bathrobe and Panama hat; it’s one of two summer leisure uniforms worn by these men over and over. The other one is worn for fishing, hunting and hiking, and we’ll get to that later. Einar was self-made, he grew up as a penniless orphan with relatives who didn’t want him, became an electrician around WWI, founded an electrical appliances store with a partner and made money. Gerda came from a middle-class background, her father was a sea captain, she had two sisters who never married and worked as switchboard operators for the national telephone company their entire adult lives. Einar and Gerda were sort of nouveau riche, and they seem to have been determined to enjoy the good life they had built for themselves. My grandmother was a spoilt only child who adored her parents. I bought a late 1910’s suit this week. I KNOW! It fits me, too, and I am not tiny. It has a few moth bites, so I have to learn how to mend them properly by weaving self-fabric fibres into the holes. The skirt is too large at the waist, which also calls for some adjustments. In fact, I think the skirt is a later addition to an older jacket, perhaps a replacement for a worn-out older skirt. The fabrics match closely, but are not the same, and while both jacket and skirt are constructed in a way that is very typical of pre-1920’s garments, the skirt strikes me as a little on the short side even for the very late 1910’s. 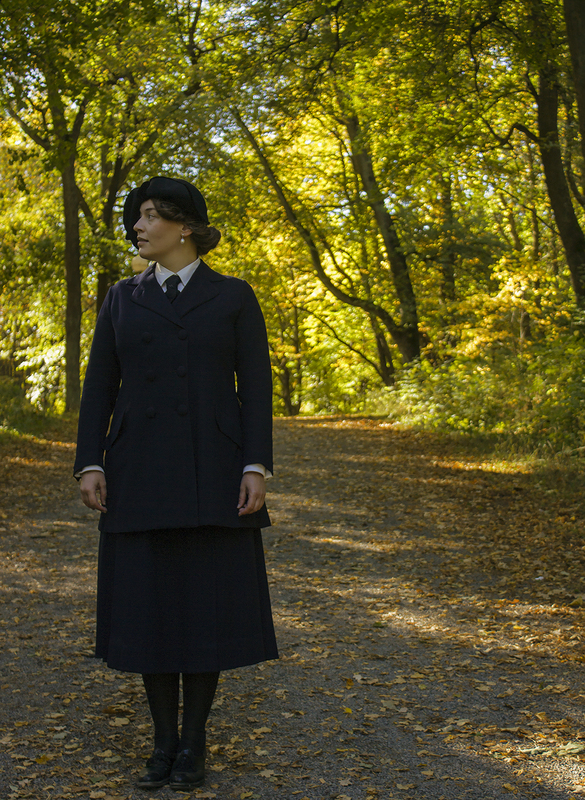 I’m 163 cm tall; that would not really have been taller than average for a Swedish woman even around WWI, and the hem looks like the original one to me. Perhaps the jacket was made in the early or mid-1910’s with a longer skirt, and a new skirt, matched to the jacket as well as possible, added five or ten years later with the new shorter length of the early 1920’s. Who knows? It’s a fantastic suit, regardless. Quite sharp, very plain and rather masculine-looking in cut and details, without any embellishment. The jacket has a lapel buttonhole, that’s it, no other details that are not functional. Even the buttons are plain self-fabric covered ones, and this level of stark utilitarianism in a suit clearly made for a woman is a little out of the common way – even very plain ladies’ suits of the era tend to have a little bit of something somewhere. It makes me think of Tatlin’s constructivist suit, which differs from ordinary suits of the era mainly through its radical simplicity; it makes away with all the vestigial and decorative details of a traditional suit. This one isn’t that radical or different, but it is very androgynous. I’m blown away by how good the straight silhouette actually looks on me. I am one of those women who tend to feel that I need a defined waist to look good, but this suit forces me to re-evaluate that idea. It has no defined waist, but I think it looks great on me. I’m trying to avoid the dreaded F-word here, flattering is nearly always shorthand for slimming, and I don’t subscribe to the idea that looking good equals looking as thin as possible. But, you know, it’s a straight silhouette that doesn’t read as boxy or shapeless, which they very easily do on a body like mine, and I don’t think I have looked as physically androgynous as I do in this thing since before I hit puberty. I like that. That’s some sorcery-level cutting, too, and I will most certainly try to take a pattern from the jacket. Close-ups, interior photos and nerdy discussion of construction details another day. I’m on vacation in roadless country and spend a fair bit of time reading. Light reading, for preference. Right now I’m alternating between Heinrich Böll’s wonderful short stories in Murke’s Collected Silences and Stella Gibbons’ Nightingale Wood, published in 1938. Stella Gibbons is practically only known for her first novel Cold Comfort Farm today, and I hunted down this one and a few other novels by Gibbons mainly because Cold Comfort Farm is the most comforting book I know, a favourite novel that holds the distinction of being the book I have bought the most copies of by far. I’ve worn it out, given it as a gift and given my own worn copy away to someone who needed it twice. Last year I finally bought myself a nice, illustrated folio edition, brought my worn-out Penguin Classics paperback up here and left it in the communal cabin library, stocked with fly fishing literature, books on arctic flora and fauna, Kar de Mumma, Fritiof Nilsson Piraten, Georges Simenon, Leslie Charteris, Agatha Christie and Aunt Mame. …some unignorable old uncle, to whom you have to be grateful because he makes you a handsome allowance, but is often an embarrassment and a bore. Which is understandable, as the success of that first novel completely eclipsed the 20-odd novels she published later in life. But I still love it the most. I’m sorry, Stella Gibbons. Her later novels are much subtler in their satire, and often have a wistful quality that I like, but don’t always feel up to. I’ve heard Westwood described as depressing, and in a way it is, perhaps. Her female protagonists are sometimes hard to like. Not because they are horrible, Flora Poste is rather horrible but also likable, after all, unlike Westwood’s Margaret Steggles, who is not horrible, but at least initially hard to like. The beauty of that is that I think I find her hard to like because I see so much of the most awkward, boring and unsympathetic sides of my own younger self in Margaret Steggles. That’s deeply uncomfortable, but also makes the character’s development throughout the novel emotional and ultimately rather satisfying. But now I’m reading Nightingale Wood, which is a Cinderella story, an unsentimental and slightly uncomfortable one, since it is Gibbons, after all. Cinderella is a former shopgirl, no lady and no Mary Sue, the prince isn’t all that, the role of the stepmother is filled by a mean father-in-law making everyone miserable, and the stepsisters are quietly tragic figures. Spinsters, stuck in an unhappy home with their highly respectable parents, who invite their recently widowed daughter-in-law to live with them, even though she is not quite quite. With dyed hair, thought Mrs Wither, for that shade of red could never be real. People did dye their hair in the 1930’s, of course, far more frequently than before WWI, but it was not uncontroversial. My grandmother once told this story about dyeing her hair around the same time, when she went to school in Stockholm in her late teens and lived in a rented room. She had her brown hair dyed darker with two bleached streaks on either side of the face at the temples. It’s visible in a short 8mm clip, I’ll upload it when I get home. She wasn’t allowed to do that, of course, and worried about what her parents would say when she went back home to Sundsvall. But it wasn’t even mentioned until they were having coffee on the veranda and great-grandmother calmly said ‘I understand that you think you look very fancy now,’ barely even looking up. Having seen great-grandmother in those films and read her entries in the guestbook here, I don’t think she found it particularly shocking. She had an odd sense of humour, too. Anachroneironaut – highly original illustrator and a close friend. Fashionable Forties – Isis’ 1940′s wardrobe project, thoughtful and inspiring. Fräulein Frauke – the fabulous burlesque artist behind Stockholms best club. Isis' Wardrobe – Isis on 18th and 17th century style and beauty. John Paul Bichard – photographer, burlesque producer and creative genius. Modärna Tider – great writing on old film and the interwar era. Real Historical Patterns – historical patterns in the public domain. Sew Vera Venus – truly excellent texts, tutorials and vintage style patterns. Witness 2 Fashion – terrific writing on fashion history. Worn Through – great, academic fashion writing. Yesterday's Perfume – well-written resource on vintage perfume.